The Grumman A-6 Intruder was designed in the nineteen-fifties as an attack aircraft for use from US aircraft carriers. 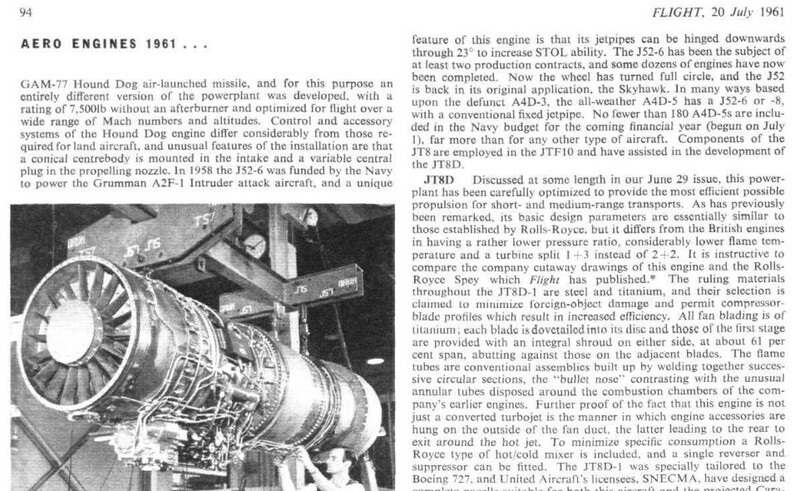 It was to replace the prop driven Douglas A-1 Skyraider and for reliability got 2 jet engines. 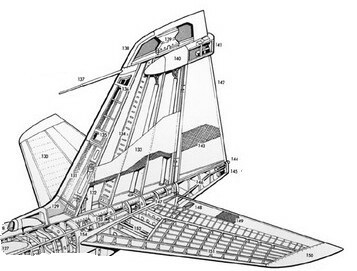 The wing was subsonic and a side by side cockpit was used to improve crew communication. It got an arrestor hook and a strong undercarriage for use on a carrier. Being an attack aircraft, it had no canon but a lot of pylons for ordnance. The first A-6 prototype flew April 1960. 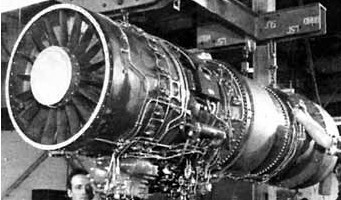 Several versions were developed, the first being the A-6A (A2F-1) that had 2 Pratt and Whitney J-52-P-6 engines. Systems completed the design with a special bomb aiming and navigation DIANE system. DIANE consisted of multiple radar systems: the Norden Systems AN/APQ-92 search radar and a smaller separate AN/APG-46 for tracking. Other systems were the AN/APN-141 radar altimeter and AN/APN-122 Doppler navigational radar to provide position updates to the AN/ASN-31 inertial navigation system. TACAN and ADF were also provided for navigational use. DIANE had teething problems but eventually worked. On the nose a refuelling probe was fitted. 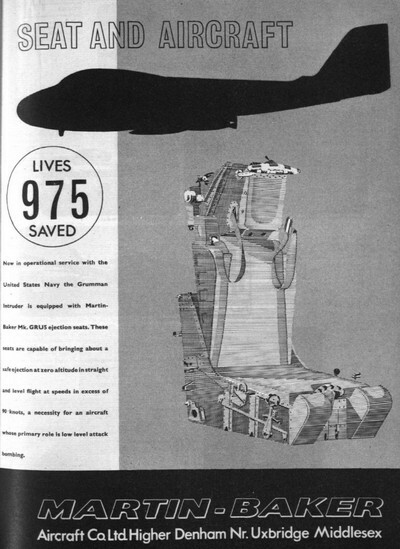 About 488 A-6A aircraft were produced until 1970 and many were upgraded after that. The more capable A-6E was also developed beginning seventies with better radar and avionics. The A-6E also had a "Target Recognition and Attack Multi-Sensor" (TRAM) system fitted in a turret under the nose. DIANE was upgraded. It has a slightly different leading edge wing root as well and an extra RAM intake scoop near the tail. A dedicated ECM version of the Intruder was the EA-6 with a large antenna fairing on top of the tail, a different nose and ALQ-76 jamming pods. Even a KA-6 tanker was developed with external fueltanks and refuelling station under the rear fuselage but it had no DIANE. A four seat specilized ECM derivative with quite different forward nose and cockpit was the EA-6B Prowler. 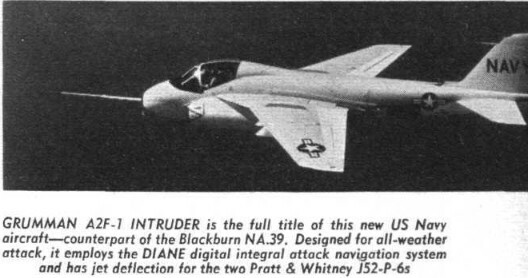 The Intruder was extensively used in the Vietnam war. In later conflicts it was also used by the US Navy e.g. Libanon, Desert Storm in 1991 etc. The last flight of the A-6E was in 1997, being replaced by the F-18 Hornet. 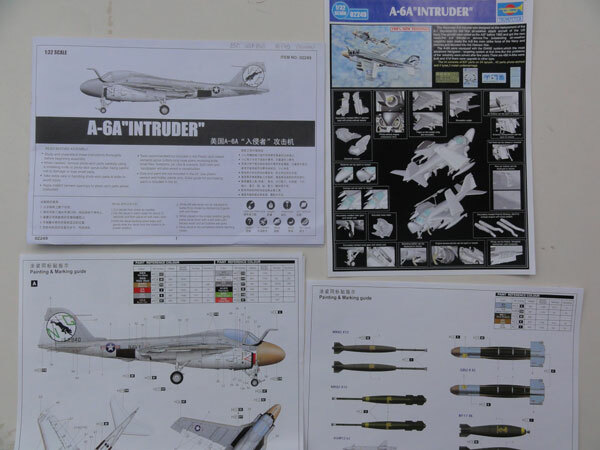 The Trumpeter kit of the A-6A (kit no 02249) was issued summer 2013 and is the first injection moulded 1/32 kit of the A-6 Intruder. 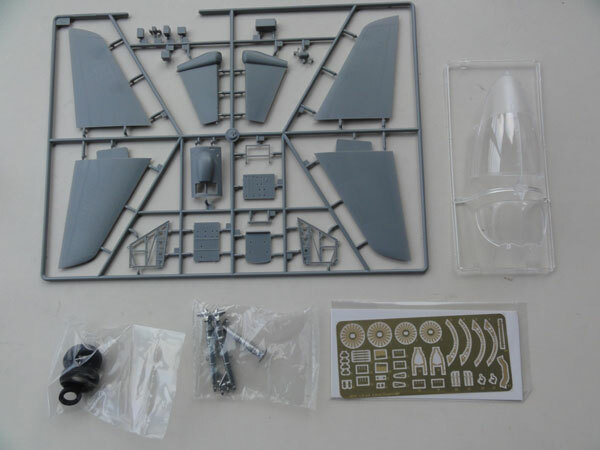 (Summer 2014 the A-6E kit was also issued). 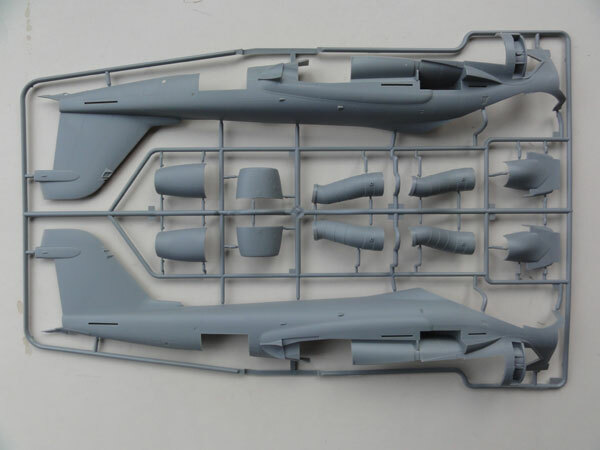 The A-6A kit is very impressive with a big model with over 500 of finely moulded plastic parts, an etched metal fret, metal parts for undercarriage, rubber tyres and 2 large decalsheets. 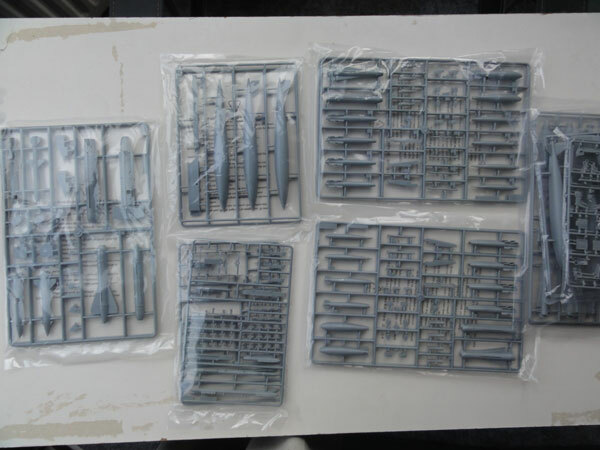 There are many sprues with stores. All panels are nicely done with recessed lines and some raised details. Impressive in this kit are the fully equipped engine bays (with 2 model engines! ), the avionics bird cage, radar nose and equipment and a very nice cockpit interior with good instruments. 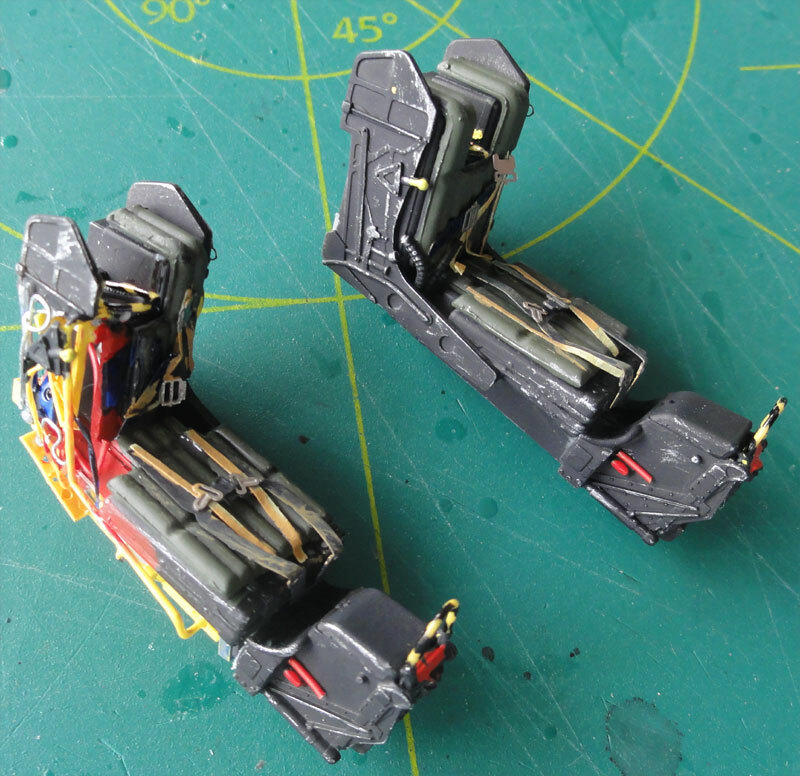 The kit seats are nice and for the GRU-7 used on later A-6 variants. Early A-6 Intruders had the GRU-5 but later A-6A's (after 1972) also the GRU-7. 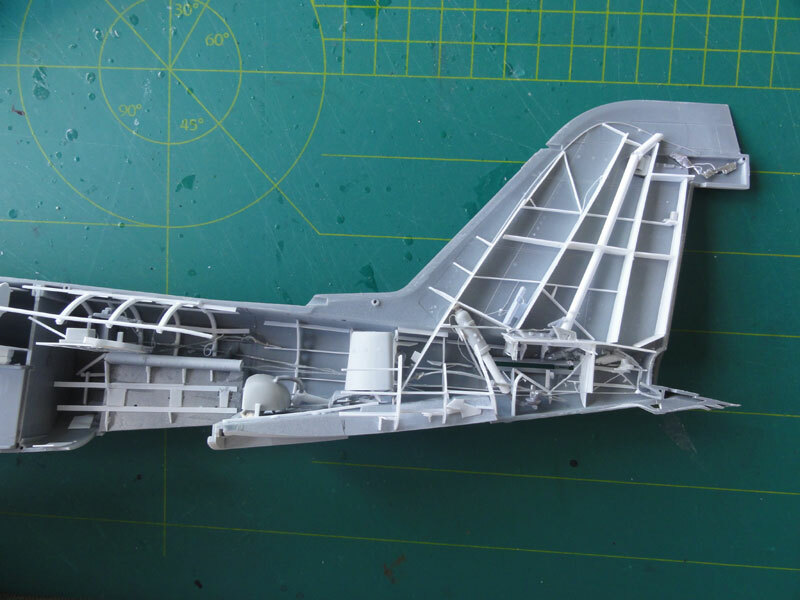 Airspeed fuselage and wing tip brakes can be set open if desired and the wing can be folded for carrier stowage. 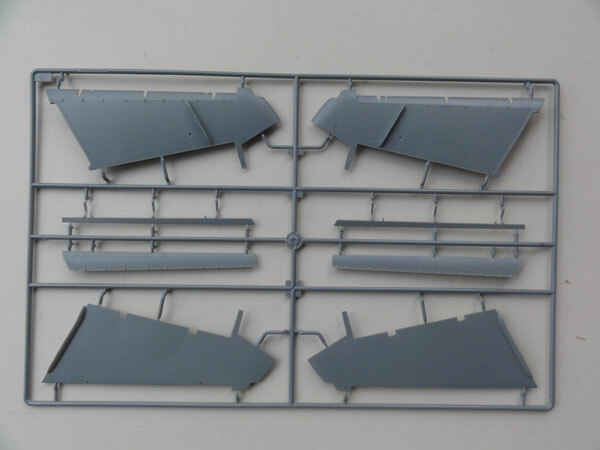 A full set of slats and trailing edge flaps are also in the kit and posable. And the kit looks accurate. Very impressive! 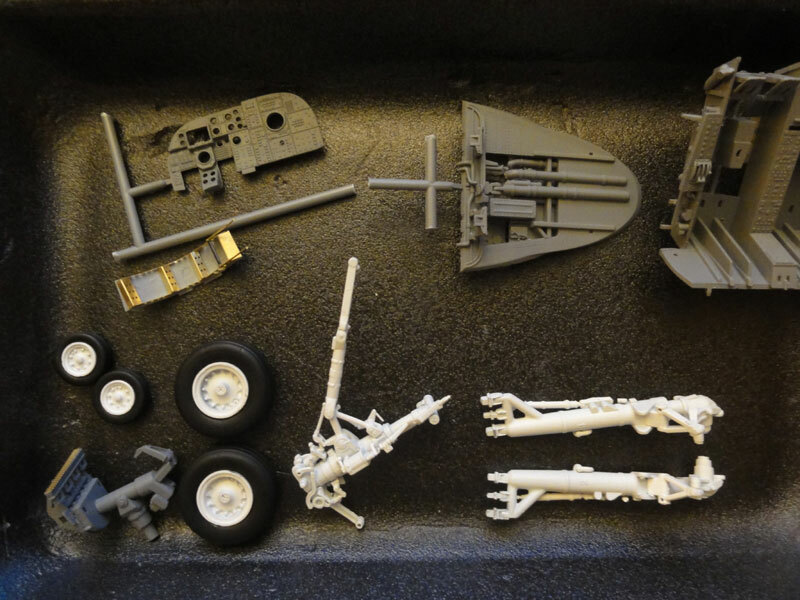 The many armaments are in the kit like Snakeyes, BullPups, GBU-8 and Shrikes but are not really accurate. 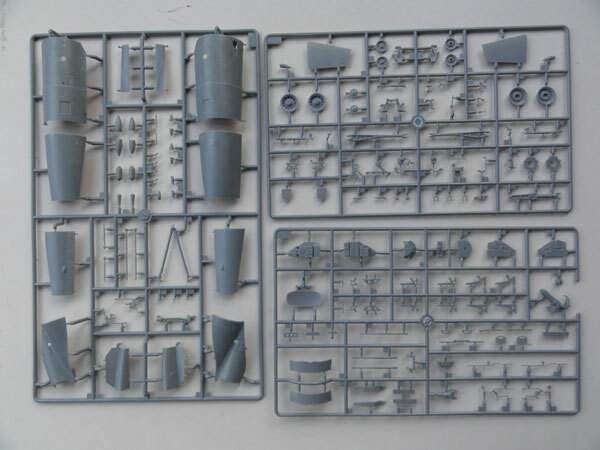 Sprue "J" is also in the kit but not indicated in the instructions. But the external fueltanks are OK. Decals and stencilling is also provided for the stores. 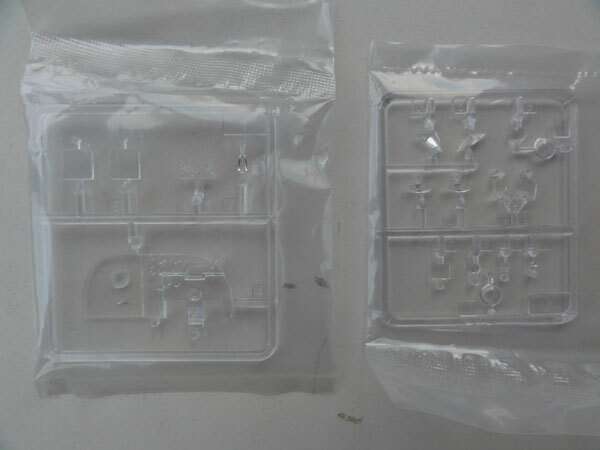 Overall, there are some 30 sprues in this impressive kit. - A-6A, BuNo 152940, VA-35, "NG/510", USS Enterprise; Panther shape not accurate. 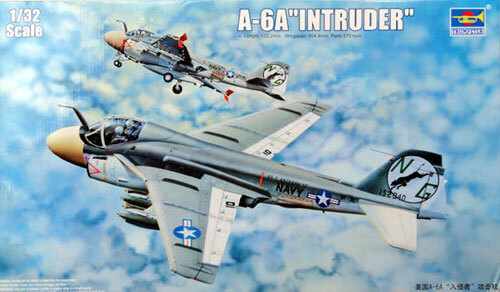 Purchased was an aftermarket SUPERSCALE decal set 32-264 for a vey nice VA-95 Green Lizards A-6A Intruder around 1975. The sheet has only the basic markings but they are fine with good "stars and bars" and NAVY titles formats. 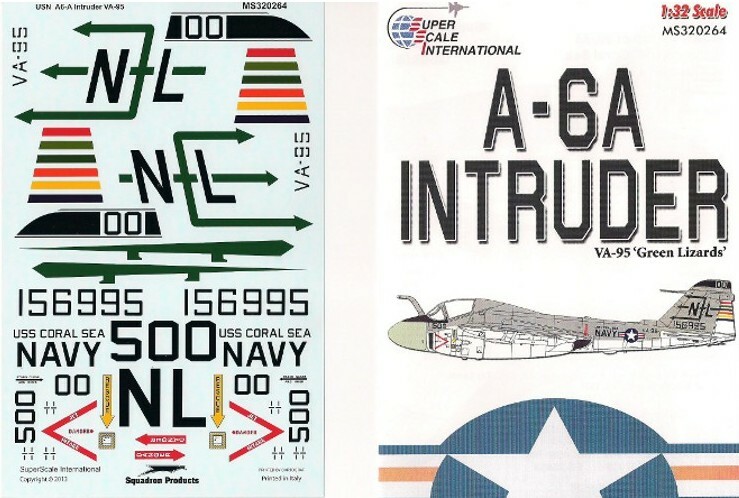 This A-6A Intruder depicted by the Superscale decalsheet has correctly no low visibility formation lights. 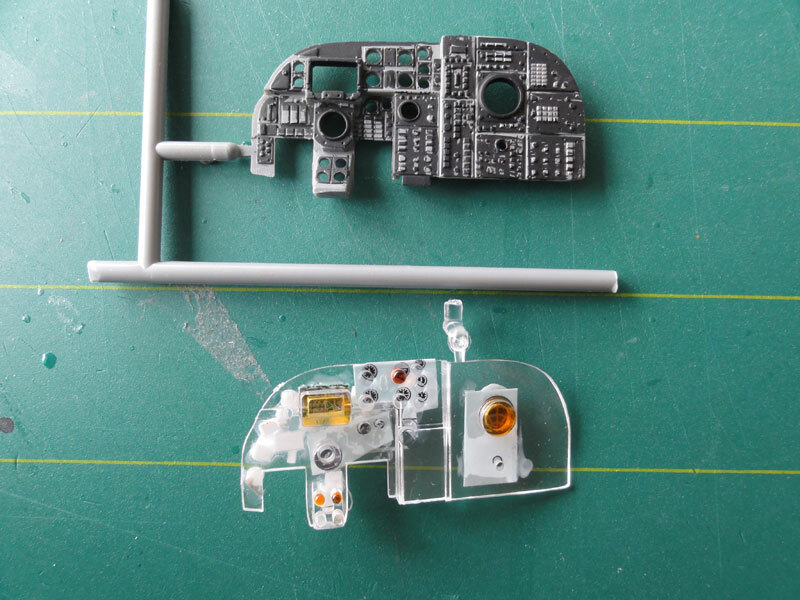 (The photo also shows that the airbrakes have no holes so the kit parts need some adjustment). It was decided to do something special with this kit. I opted to make "a cut away" model with the left side with opened panels and showing the airframe structure and the right side as a regular model with panels closed. This strange bird is a change to regular models made. (STEP refers here to the kit instructions sequence). 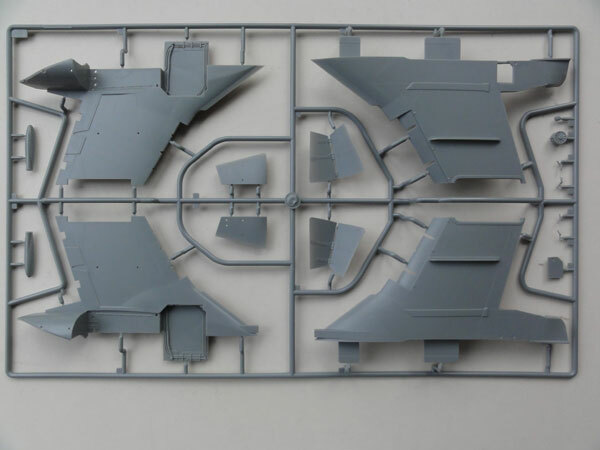 As the model would be made as a "cut-away" , the large kit parts suchs as fuselage halves, wing sections etc were first separated from their sprues. The "left side" would be opened up with various panels and hatches. 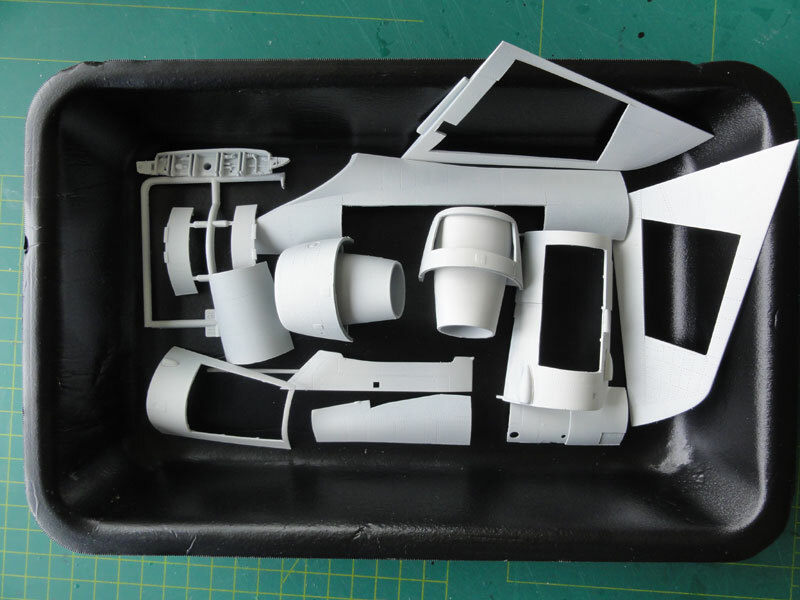 Luckily the kit itself has also many open hatches such as for engine bay, airbrakes, avionics and nose. With a TIGER razorsaw, scoring along inscribed panellines, various panels were opened up. This requires some carefull studying of the cut-away drawing also to keep some model structure strength. So the major surgery is done early while good handling is possible. 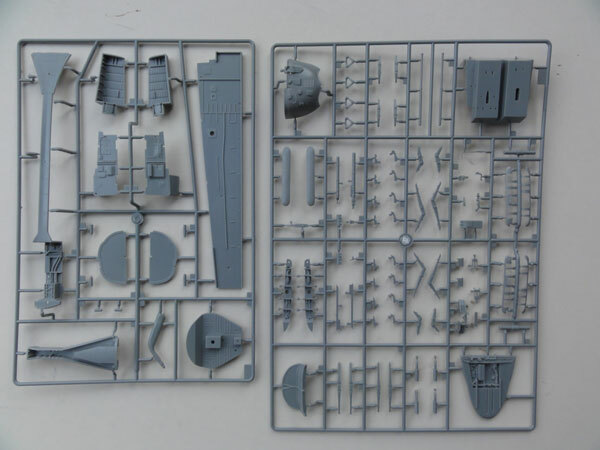 The model cut-away will be set on a display stand available. A hole was cut in the lower "belly" to accommodate a pin later on. Next, the various airframe model components were tackled using sound aerospace engineering practices regarding rib structures, bulkheads, beams and spars. 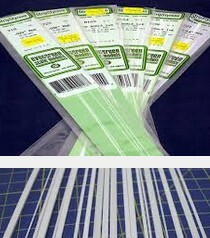 With various pieces of plastic rod (e.g. from EVERGREEN), structures were made. It was now also time to PRE-PAINT some parts at this stage with the Harder Steinbeck airbrush with many parts still in the sprues. 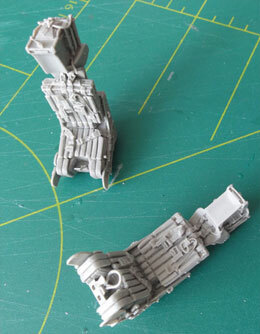 But first, many attachment "sprue gates" were removed as far as possible to reduce later retouch work. 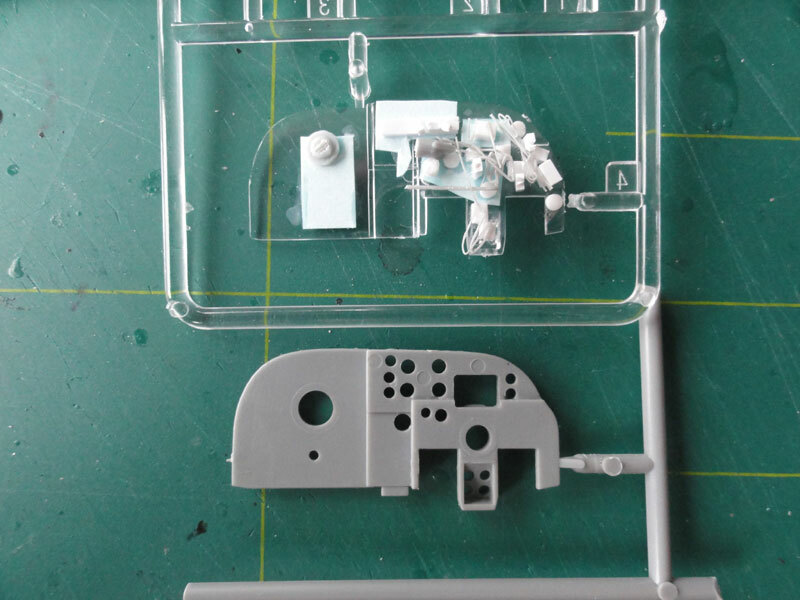 Many parts were also a bit assembled before pre-painting, an example being the "bird cage" in STEP 5. 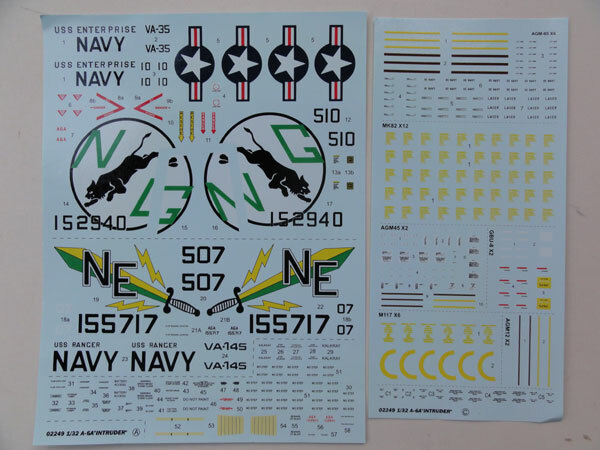 Most common colours of the old style A-6 US NAVY scheme are white, mat black and US Navy gull grey Fed.Std FS 36440 (using Gunze Sangyo H325 acrylic). For the white FS 36875 Gunze Sangyo H1 acrylic was used and airbrushed. 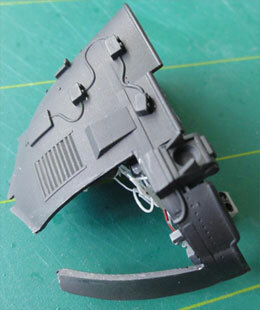 Some parts are seen here "pre-painted" with the right side and heavily cut left side! 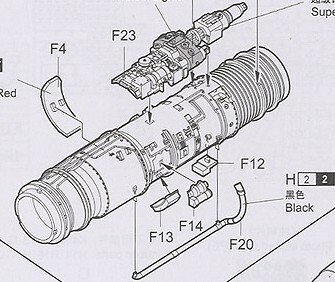 A single engine would be displayed inside the model, in the "left side" engine bay. 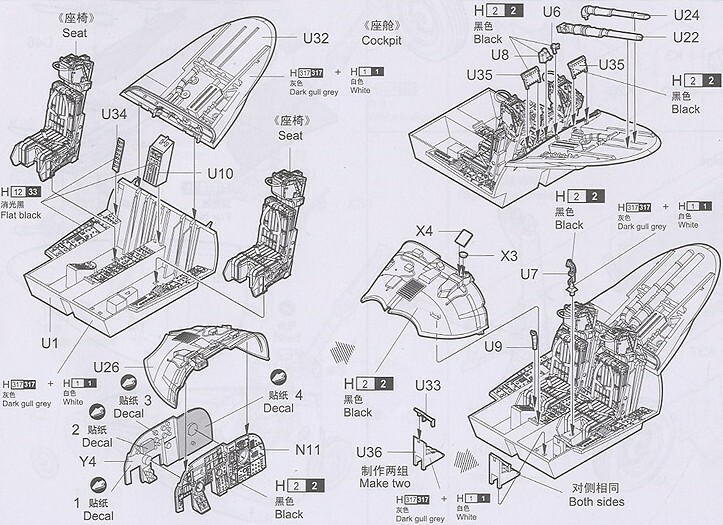 The engine model parts in the kit are nice, but part #F19 should be set differently as shown in the instructions. I also removed a section of 5 mm of parts F18+F22 and fitted this in front of the engine fan, so setting the engine a bit more aft in the bay. NOTE: later I replaced the thick firing wires on parts S13 with thin wire painted yellow and black. The seats were painted black with olive drab cushions and parapack. 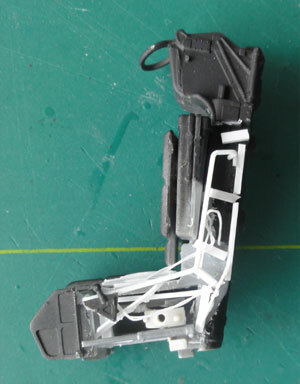 Straps were from the PE from the kit and tape with some buckles from the spares box. 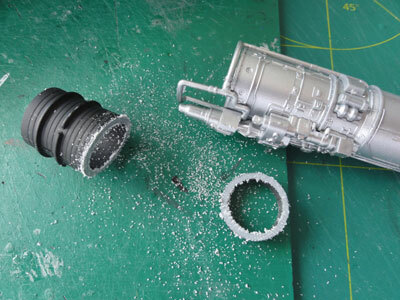 Some drybrushing was done. Note one "cut away" detailed pilot seat. The seats were side aside for later installment. Some warnings signs on the head rest to be set in place as well later on. Some tub floor panels from part U1 were cut away to show later the control rods and cables below the floor. Control sticks were not yet set in place. From the coaming U26 also a section was cut away. 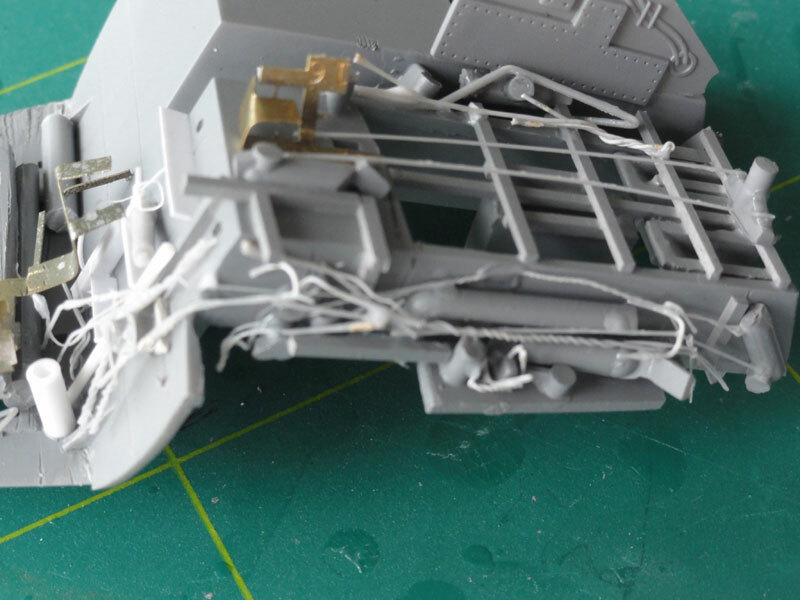 Additional details were added from stretched sprue, wire etc. To the rear of the nice instrument panel H2 + Y4 some details were added. They seem accurate with CORRECT angles and details. 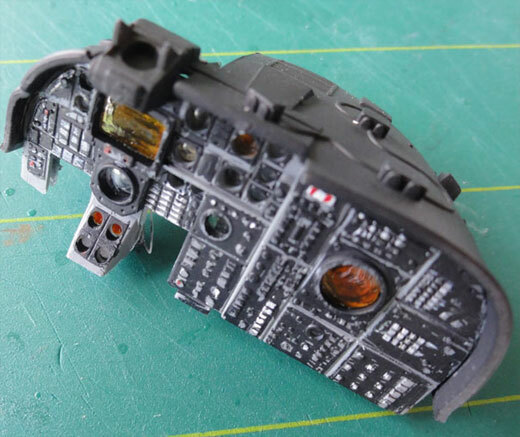 The instrument panels are OK and accurate in the kit for the A-6A. Some paint acrylics were used of medium grey with black panels and light grey knobs and switches. The orange scoops are painted with Tamiya Clear orange acrylic. The pilot left station shows a large display being the vertical display indicator and the left round scoop the horizontal display indicator. 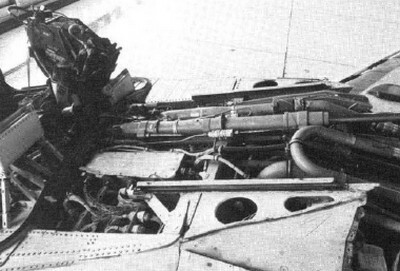 The navigator/bombardier station at the right shows a single large Direct view indicator on the A-6A. (on an A-6E two displays are here). NOTE that the flight director sight is still to be added later (parts X3 and X4). The aft coaming part U32 was also cut open, a photo used for reference. The cuts now shows a bit more depth now and parts U22 + U24 are nicely done in this kit. 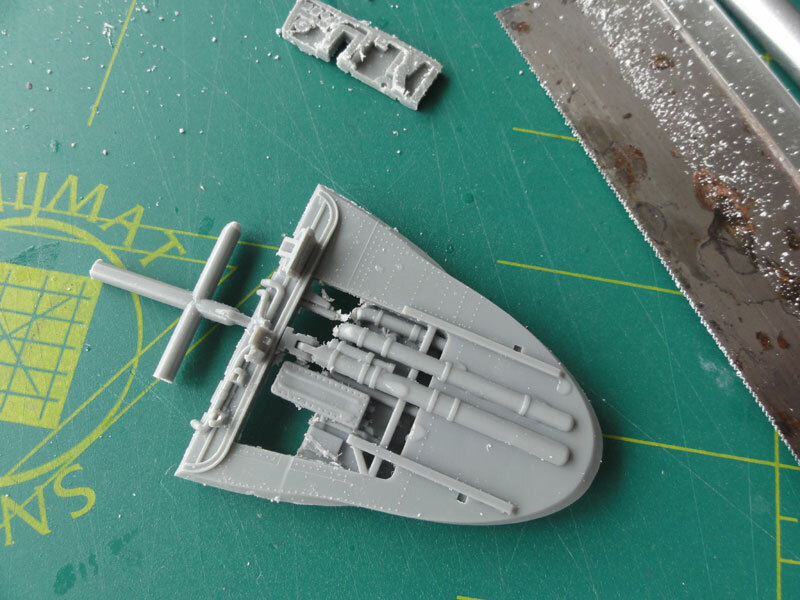 Also the landing gear is nicely done with big metal parts for strength, well done Trumpeter! 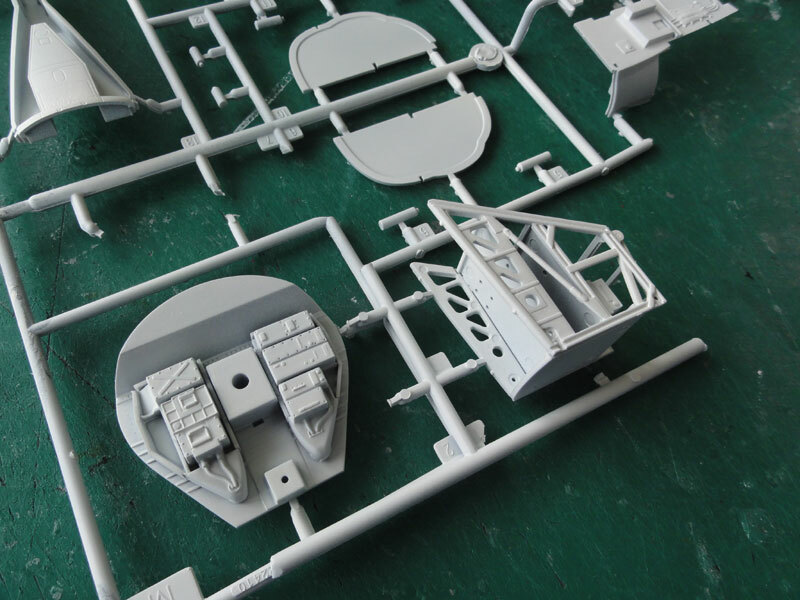 Only some hydraulics tubing and wiring is to be added for additional detail. The kit tires are in rubber so ensure the plastic hubs (K7+K18 etc) are covered with paint to prevent many years later the "softening" of the hubs by the rubber fluids. I did not use Parts K8. The wheel were not yet set on their legs. Main surfaces of the undercarriage are white with "black" pre-wash to be added later on. Flight International: no.4229; no.3961 .